While there are tons of fantastic outdoor activities to experience in Southern Utah, few match the sheer excitement of taking a snowmobile for a spin around the breathtaking snow-covered landscapes. Snowmobile rentals in Brian Head give you the ability to explore winter locations that are difficult to reach by foot while adding a level of adrenaline that you won’t get partaking in other activities. If snowmobiling is a little too fast for you, check out our free Southern Utah Vacation Guide! It’s full of local tips and ideas for your perfect winter trip. For a fun and unique snowmobile rental in Brian Head, Thunder Mountain Motorsports provides the best experience. They offer three different snowmobile tours that range from a 1.5-hour excursion to an all-day tour. Race through the winter beauty of Southern Utah on your guided snowmobile tour without worrying about maps or knowing your way around the area. Your guide will show you the incredible landscape while making it safe and fun for everyone! When using Thunder Mountain Motorsports for snowmobile rentals in Brian Head, you can expect to visit several notable places nearby. Each ride varies based on time and rider ability. Some of the regular routes include Dixie National Forest, Brian Head backcountry, and Cedar Breaks National Monument. Here’s what you need to know about each of these locations. Dixie National Forest is full of highs and lows. Feast your eyes on the towering rock spires and craggy, deep-cut canyon walls. This two million-acre park is the perfect place to experience a variety of different landscapes on your snowmobile tour. Rolling, powder-white hills dotted with green pine spires dominate this scenic and tranquil land. As you zoom around on your snowmobile, you’ll spot plenty of skiers and snowboarders hitting the top-notch slopes. One of the most popular locations for a snowmobile tour, this site is a naturally formed amphitheater. Ride up 10,000 feet to the summit and enjoy a truly breathtaking view of the surrounding canyons and mountains. Temperatures can drop quickly while you’re riding around because of the wind chill and changing altitude. It’s important to know what to bring and how to prepare, especially if this is your first time. Snow boots or waterproof shoes are essential as you’ll make several stops with the opportunity to play around in the snow. Riding the rest of the way with wet socks is never fun! Boots and shoes can be rented from Thunder Mountain Motorsports for an additional $5. Be sure to layer up as the wind can be bitterly cold. If you get too warm, you can always remove one of your under layers. Hand and foot warmers are great to bring along, especially if you have the kids with you. Your Brian Head Family Vacation Home Awaits! A Family Time Vacation Rental is the perfect place to call home after a day full of zipping through Southern Utah on your Brian Head snowmobile rental. Our properties have excellent locations, giving you access to some of the top national parks in the country. Whether you want to attend one of Southern Utah’s many events, hike Zion National Park, or learn to ski in Brian Head, there’s something fun for everyone in the family! 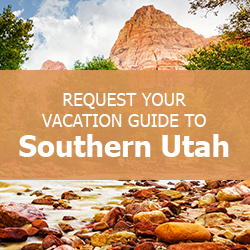 Check our availability and don’t forget to download our free Vacation Guide to start planning your Southern Utah getaway today!